Last week i got the season's first mangoes from an Indian shop, and i was totally excited to see them . For those who follow me on twitter know, as i already mentioned it there. As the season is slowly coming up here, the mangoes for not very sweet, but nor very tasteless. They tasted ok, but varsha wanted me to make mango milkshake. 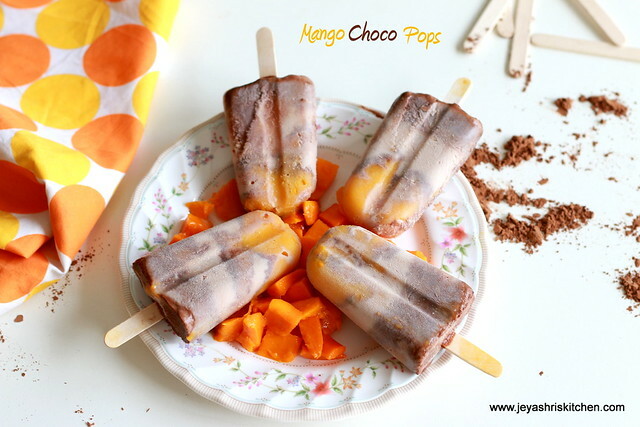 I made for her and with one left over mango i made a mango chocolate Popsicle. I just added mango, cocoa powder, milk and sugar.It tasted very nice. Instead of cocoa powder you can nutella too. If you want to follow the easy method , just grind all the ingredients in the mixer and pour them into popsicle mould and freeze it. 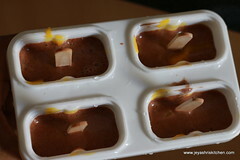 I wanted layered popsicle and so i mixed cocoa powder , half of the sugar and half of the milk separately and mixed mango pulp , other half of sugar and half portion of milk together and layered in the moulds to get a nice effect. 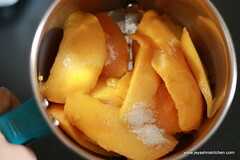 Peel the skin of mangoes and cut them into slices. Discard the seed. Grind this along with sugar and keep it separately. If it is too thick add 1/4 cup of water. 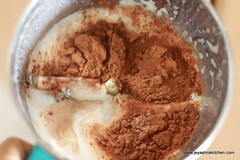 Whip up the cocoa powder with half portion of milk and sugar. Wash the moulds and keep them ready. 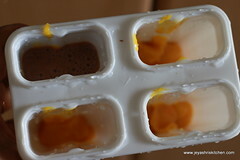 pour one layer of mango mixture to the moulds. 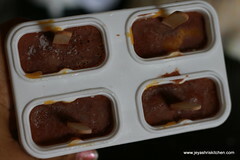 Then pour the chocolate mixture to this and again add the mango mixture. 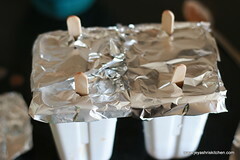 I used the ice cream sticks , if you don't have just close them with the lids which will come with the popsicle mould. Cover this with a cling wrap or aluminium foil. Freeze this for 7-8 hours or over night. 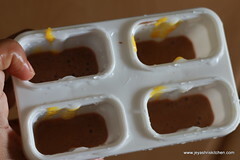 Once done, run this on water and slowly take out the popsicle from the mould. do not pull the stick fast. 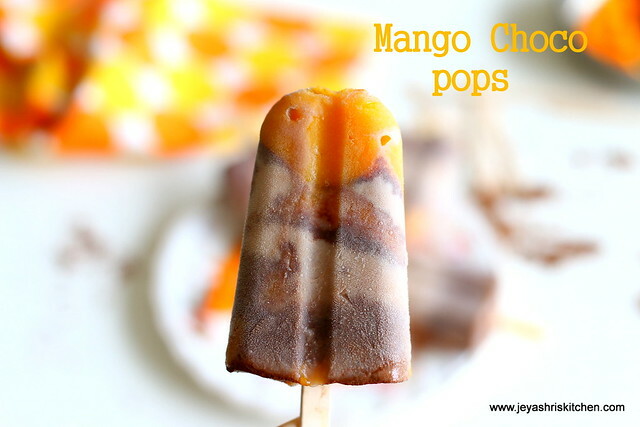 Gently pull it out and enjoy the mango popsicles. My kids really enjoyed it. You can even engage the kids during this summer holidays by asking their assistance to make the popsicle . Do not add cocoa powder more than the mentioned quantity. It will taste bitter. You can add store bought chocolate milk too. You can add few mango bits to make it interesting. You can add milo or bournivita or any chocolate health drink instead of cocoa powder. Loved the template..completely and love the shot.. definitely a great one when summer is around. oh awesome. me and the sonny are doing a lot of this on the holidays. Such a refreshing kids loving recipe !!! Your new header is refreshing too jeyshri!! I want those pops, cant take my eyes from those cuties. 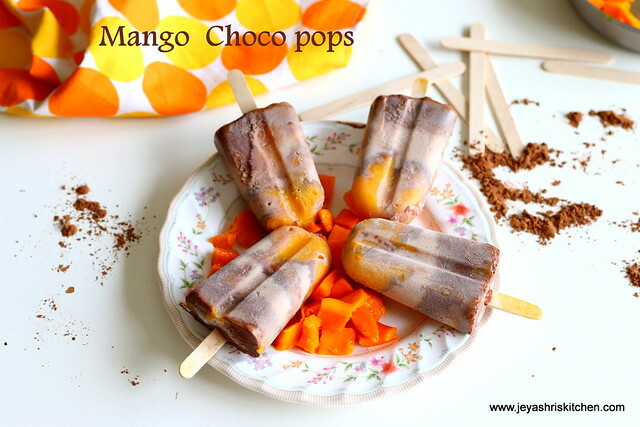 awesome mango lollies, Will try this. Thanks for the link.Will try soon.